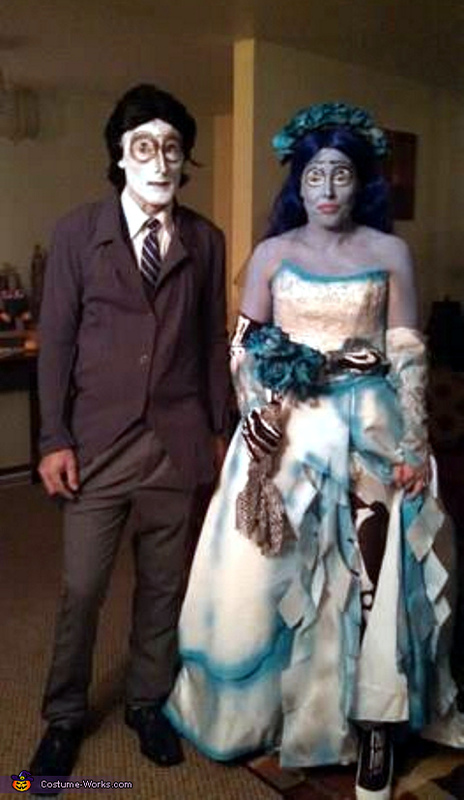 My husband and I got our inspiration from Jim Henson's The Corpse Bride. We dressed up as Emily & Victor. I took an old wedding dress that I had on hand and cut the train off after I cut it up,and decided I did not like it. My coworker gave me her old wedding dress so I cut the train off that and hand sewed it to the other dress. This took a lot of tedious effort to make it look like it originally belonged there. Once that was complete I purchased spray paint (aqua and black) and spray painted the dress to resemble Emily's dress from the movie. I used an old veil and hot glued artificial flowers to it. The artificial flowers were originally white and I spray painted them aqua, royal blue, and black. I cut up the material to the veil and added old material to it to give it the tattered look. I cut a slit in the front of my dress and cut it up and down the front to also add the tattered look. I purchased a skeleton corset to add underneath the dress so it looked like my rib was sticking out of the hole that I cut in the top left side of the wedding dress. I spray painted around it. I purchased skeleton tights for one leg and tucked the remaining leg into the top of the tights underneath my dress. I made the maggot from the movie (that pops out of Emily's eye) out of baked clay. I purchased a skeleton dog head (Victor's deceased dog Scraps in the movie) and built a box around him to give him the "gift effect look" as he was a gift from Emily to Victor as a wedding present in the movie. For my husband's costume (Victor) I took his old dress pants and hand sewed them to his body for the slim look. I took an old trench/jacket coat and cut it to resemble Victor's jacket in the movie. I also sewed that to fit tightly to my husband's body. I purchased our gloves, wigs, and used old shoes to complete the look. My husband built a casket from an old wooden box. He cut the wooden box down painted it and added trim to it. To complete the look he added handles to the side of the casket out of all wood pieces that he found in our attic. He spray painted the trim and wood handles flat black. He added casters to the bottom of the casket so that he could push me around easily and added a handle to spare his back. We purchased makeup and followed makeup tutorials from YouTube to follow the characters faces with accuracy.